The recent study conducted by NGO Forum for Urban Water and Sanitation has found 68 public toilets in the Kathmandu Valley including 29 toilets in Kathmandu, 18 in Bhaktapur, 6 in Lalitpur, 9 in Madhyapur Thimi and 6 in Kirtipur. Out of 68 toilets, only 61 are functional and 7 toilets are not is use. But, unfortunately many functional toilets are in deplorable condition without even basic standard of cleanliness and facilities. Basic facilities like running water and hand-washing provision are not there in many public toilets. It seems that the caretakers and authorities responsible for maintaining the public toilets are not doing their job properly despite charging high toilet fees from the users. The toilet operators do not care about the facilities and hygiene condition of the toilets. Similarly, it is the sheer negligence of the municipalities for not monitoring the operation of the public toilets. Therefore, the municipalities should make their monitoring mechanism strong to ensure basic facilities and cleanliness in all the public toilets. In addition, the municipalities should give priority to the construction of more hygienic public toilets in their respective municipalities. And, for the toilet operators, they should realize their duties and pay proper attention to maintaining the basic facilities and cleanliness in the toilets. Kathmandu: Lumanti, a non-government organisation, has started a rental housing project for low-income families. The project aims to ‘influence’ the government to come up with a policy to promote rental housing to offer affordable homes to the poor. Lumanti will build a four-storey building on 9.5 annas of land in Dhobighat, Lalitpur. Each of the 24 units will have an area of 180 sqft and will include a kitchen corner, toilet and balcony. Kathmandu: Under fire from local people, officials of Kathmandu Upatyaka Khanepani Limited (KUKL) today visited Milan Chowk and Sangam Chowk area to take stock of the filthy water supply. Staff from KUKL Baneswor branch checked the site on direction of the central office and found that the problem was because of seepage as the pipeline and drainage system ran parallel in the two areas. Kathmandu: If all goes as planned by the Kathmandu Metropolitan City (KMC), the Capital city may soon wear a cleaner look. The metropolis is all set to boost public participation in keeping the city clean by introducing a campaign “Clean Kathmandu-Our Kathmandu.” The metropolitan city aims to deploy 10,000 volunteers everyday for the week-long campaign beginning April 6 in the first phase. Kathmandu: The Ministry of Energy today issued survey license to Balaju Biomass Company to carry out feasibility study to generate electricity from solid waste. The company has been given one year to complete the feasibility study at Sisdole Landfill site. It is estimated that 15.5 Megawatts of electricity can be produced from there. The total energy production per year would be 98.2 crores units from solid waste dumped at Sisdole,” the document submitted to the energy ministry claims. Kathmandu: People living in Milan Chowk, Sangam Chowk and Madhya Marga in the Capital were delighted yesterday to have water in their taps after about a week, but what they experienced promptly threw cold water on their enthusiasm. There was filth, mixed with human excreta, coming out of the taps instead of what was supposed to be drinking water supplied by Kathmandu Upatyaka Khanepani Ltd, said locals. Kathmandu: The government has decided to start providing house rent for landless squatters’ families from March end. As many as 190 landless families residing on the banks of the Bagmati River from Thapathali to Tekudovan will receive Rs 15,000 each in lump sum as rent for three months in the first phase. Kathmandu: Prime Minister Baburam Bhattarai has said the government is planning to provide Rs 15,000 per family to landless squatters for alternative accommodation before evacuating them from areas occupied by them encroaching public land in the capital. Bhattarai made the announcement in the presence of representatives from 17 fringe political parties who met him at his office on Saturday to submit a memorandum demanding that the peace process and constitution writing be concluded before the expiry of Constituent Assembly (CA)’s tenure on May 27. Kathmandu: In the bid to keep the city clean, the Kathmandu Metropolitan city (KMC) has decided to organize ‘clean Kathmandu campaign’ with the help of the people and politicians from the second week of April. The campaign will be organized in all ward of metropolis with the participants collecting garbage, sweeping streets, cleaning rivers and creating awareness about the importance of cleanliness. Kathmandu: WaterAid Nepal, an INGO working for water and sanitation, is marking Nepal National Water Week 2012 by supporting the ‘world walks for water and sanitation global campaign’. A press statement issued by the INGO on the occasion of World Water Day today said walks are taking place in 14 districts in the country, with 8,000 people walking country-wide and over 300,000 globally. Kathmandu: The International Water Management Institute (IWMI), which has a country office in Nepal, has been awarded the Stockholm Water Prize Laureate -2012. The prize is conferred on individuals, institutions or organisations contributing to conservation and protection of water resources. “IWMI’s work in Nepal has contributed to policy changes, methodology development, institutional strengthening and capacity building,” said IWMI in a press release today. Kathmandu: Kathmandu Valley Water Supply Management Board can only meet little above one fourth of the water demand. There is per day shortfall of 256 million litres in the dry season and 219 million litres during wet season in Kathmandu. Hari Prasad Dhakal, executive director of the board said the gap has increased by 36 million litres in dry season and 54 million litres in wet season within one year. Kathmandu: Public toilets in the Kathmandu Valley are in pitiable condition. A recent study has revealed that the Kathmandu Valley lack public toilets and the existing toilets are in pitiable condition. A study conducted by NGO Forum for Urban Water and Sanitation (NGOFUWS) to find out the condition and status of public toilets in all the five municipalities of the Valley has pointed out on the need to improve the public toilets. Lalitpur: Sounds unbelievable, but office-bearers of the Melamchi Water Supply Project have claimed to provide drinking water from Melamchi to the Kathmanduites by 2015. Speaking at a programme here organized by RECPHEC and NGO Forum, the office-bearers of the project claimed that the construction works of the project are going on without any hurdles though only 15 per cent of the total work has been completed so far. Kathmandu: Kathmandu Upatyaka Khanepani Limited (KUKL) is cutting off pipeline connections of the customers who have not cleared their water bills. KUKL has started to cut off pipeline connections of the defaulter customers from Thursday after they did not respond to the frequent requests of KUKL to clear water bills. 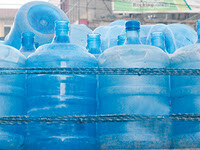 Kathmandu: The Nepal Bottled Water Industries Association (NBWIA) has planned to monitor the main sellers of bottled water in a bid to maintain the quality of the products being sold in the Kathmandu valley. The association has said that it will form a separate monitoring team for the purpose. NBWIA president Dharmananda Shrestha said that the team would work in coordination with the concerned government agencies. He added that the association had directed its members to use jars with their logos printed on them and neck-seals on their PET bottles as a quality control measure. The formulation of the much-awaited Hygiene and Sanitation Master Plan (2011-2017) that envisions an important role of local government bodies in providing water and sanitation facilities throughout the country is considered crucial at this stage to mainstream the efforts of the related actors at various levels. No matter how many Open Defecation Areas (ODFs) Nepal declared in recent years, the country is likely to miss the Millennium Development Goals and the ambitious goal to ensure universal sanitation and safe drinking water by 2017. After the government in 2002 announced to declare all the VDCs open defecation free by 2017, only 300 of the total 3,915 units have been declared ODF in 75 districts. Kathmandu: The Kathmandu Metropolitan City (KMC) is all set to mobilize 100,000 volunteers from the second week of April this year for maintaining cleanliness in the Kathmandu Valley. The KMC has planned to prepare one volunteer from every house in the metropolis for the purpose. Chief of KMC Environment Division Rabin Man Shrestha told that the KMC is preparing to launch week-long cleaning campaign in the first phase. Hetauda: The locals of Padampokhari Village Development Committee (VDC) of Makwanpur now have to show their sanitation identity card to receive any sorts of service that has been provided by the state. The meeting of Drinking Water and Sanitation Coordination Committee that was held on Wednesday decided to make it compulsory for the residents to produce sanitation identity card before receiving any service provided by the VDC office. 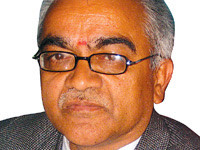 Nepalgunj: Lawmaker Sunil Babu Panta today inaugurated gender-neutral toilets in Nepalgunj in the midst of a programme. The two toilets were set up in different locations of the city by Pashchim Tara Nepal, an organisation working for the third gender, with assistance from the Parliamentarian’s Development Fund. Biratnagar: Waste Processing Project to be constructed at a cost of Rs. 600 million with the help of Finland government is on the verge of return if favorable working environment was not guaranteed within three months. The processing centre to be constructed in Dangraha VDC, Morang, where both Finnish government and Nepal government will finance Rs. 44 million and Rs. 150 million respectively. Biratnagar: "Filthy Place," are the most probable words that invade the mind of people when they see a public toilet in Nepal. With the sighting of public toilets, people in Nepal start covering their nose and mouth out of fear of foul smell that comes out of such toilets. The situation tells a sorry tale of public toilets at the most places in the nation. Dadeldhura: Locals alleged that there have been financial irregularities worth millions of rupees in the rural reconstruction project. The project is involved in carrying out development planning and constructions in the district. Questions have been raised about the project, an undertaking of the district development committee regarding the financial misuse in the construction of Bagbazaar-Bagarkot and Budar-Jogbuda road sections, Bhatgaad drinking water projects and suspension bridges. Pokhara: Kaski was declared as the first open defecation free zone last year, but the declaration does not seem to have reflected much on reality. Particularly in settlements of landless squatters in the Pokhara Sub-metropolitan City (PSMC), Lekhnath Municipality and Lumle Dhawa, people still defecate in the open. The two cities also do not have public toilets, affecting pedestrians and tourists. A campaign with the theme ‘one toilet for every household’ has not been implemented effectively. Chitwan: Chitwan district was declared an open defecation free zone last year. But the declaration appears to have come too soon. Local authorities were more motivated to become second district after Kaski and paid little or no attention to necessary preparations. The campaign has not been effective as many public places in the district are yet to get toilets, while some latrines constructed during the campaign have been damaged. New Delhi: Indian census data has revealed that more homes in the country of 1.2 billion people have a telephone than a toilet. The figures, collected during the 2011 census, shed a light on how India’s rapid communication revolution has spread through society but that basic sanitation is still scarce. When the dry season is around, the capital city is parched and nervous to quench its thirst. When drinking and cooking is the greatest problem of the day, forget about doing your laundry and taking a bath. If you ask a leader or a water supply authority, they are likely to give readymade answer- buy water in the market. They are doing just this- failing to tap available water sources and let the commercial people take advantage of the situation. For drinking purpose, purchase the bottled mineral water and for other purposes, contact the tanker people. That is only the option left. This refers to the news report “KUKL draws fire for supplying filthy water” (THT, Mar. 27, Page 1). This is not the first time that Kathmandu valley people are suffering from the dirty and filthy water from the public water taps. But this time, KUKL has beaten all the previous records, supplying human etcetera in the water taps. I agree with Dr. David Molden that our success in conservation and proper utilization of water could lead to greater prosperity (Battle against time, March 23). Hence it is imperative to step up processes to improve our water systems. Millions of people in Kathmandu are facing serious shortage of drinking water. This problem could be addressed. 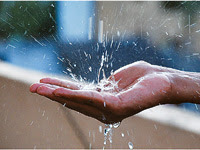 The World Water Day 2012 serves to accentuate how desperate the overall situation is for water has become a scarce commodity in many parts of the world. The supply of water available is not illimitable. As the population growth of humans continue to escalate so does the demand for water, particularly potable water. Much of the population inhabiting in the developing countries do not have access to safe drinking water, although emphasis has been given to provide them with this now scarce commodity. March 22 is marked as the International World Water Day. An international day to celebrate freshwater was recommended at the 1992 United Nations Conference on Environment and Development (UNCED). The United Nations General Assembly responded by designating March 22, 1993 as the first World Water Day. And since then this day has been highlighting the specific aspects of water and the world celebrated this year’s World Water Day with the theme ‘Water and Food Security’. We all know that water is essential for drinking, health, cleanliness, electricity, and the environment, but most people tend to underestimate the importance of water for food production. We also tend to take for granted the many actions required to manage water to get it to our houses or to farmers’ fields, or to produce electricity. This is especially true in the mountain regions of the Hindu Kush Himalayas, where water is abundant in nature but at the same time many people feel the pinch of water shortages.